The NASS Safety and Health Awareness Day held on the 26th June 2018 in conjunction with the HSE and Wolverhampton City Council was a great success! We welcomed 68 delegates to the fantastic new EEF Technology Hub in Birmingham, home to Manufacturing Apprenticeship training for the West Midlands. The theme of the Seminar was centred around working with vehicles with particular considerations for delivering to customers premises. We also took a look at touching steel as well as engineering safety solutions from NASS Members. Sarah Palfreyman of the HSE highlighted up and coming enforcement trends for the metals and manufacturing industries, indicating the HSE are looking for a reduction in the cases of occupational lung disease, MSDs and work-related stress in line with their three-year manufacturing sector plan. As part of the HSE’s focus on lung disease, the HSE’s Proactive Inspection Programme for 2018/19 will be targeting risks associated with asthmagens, carcinogens, Respirable Crystalline Silica (RCS) and welding fumes. NASS Vice President, Michael Horan of Liberty Performance Steels and Gemma Wigley of Wigley Logistics Ltd. took a look at loading and unloading steel products. Michael and Gemma explored the "Steel Logistics Journey” looking at key responsibilities, planning (including the delivery plan), load security, behaviour and communication. Rebecca Wilson of Kloeckner Metals UK and Joy Graham of NASS looked at Work at Height on Trailers and in particular the risk to drivers at customer sites. The session focused on driver risk assessments and how drivers handle situations where the correct controls do not exist. Rebecca also gave delegates insight into Kloeckner’s edge protection "time line” including new designs for 2018 onwards. NASS Director General Peter Corfield approached the age-old issue of touching steel by looking at the "Be Clear, Stay Clear” journey. This session focused on the reasons for touch steel and whether they were habitual or necessary, including ideas from Members for eliminating habitual reasons and "engineering controls” for the necessary reasons. Jason Hancock of Barrett Steel Limited took a look at Forklift Trucks and communication, isolating an incident in which a driver was seriously injured working with an FLT operative. This session included a look at the communication process between the offloading "team” and how this can be managed to encourage clarity during the offloading process. 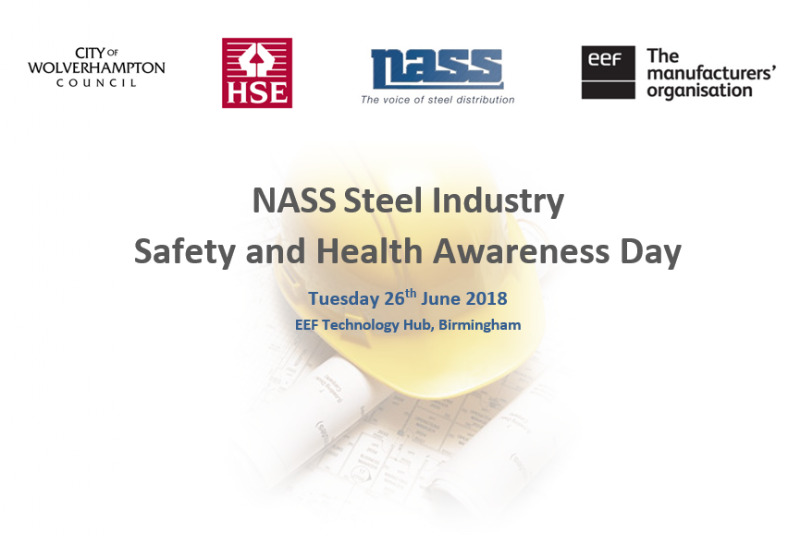 We would like to thank EEF for hosting the NASS Safety and Health Awareness Day, NASS had excellent feedback from all who attended and we are grateful to all who participated to make this such a successful event.